In 2015, Ron Vlaar found himself in the situation of having knocked back a renewal offer from Aston Villa and picking up a serious injury which required surgery. 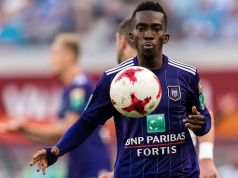 The Dutchman was left without a club and, perhaps crucially, without a club’s medical team dedicated to getting him back on the pitch as quickly as possible. It took a lot of work but he managed to rebuild his career at AZ, the Eredivisie club where he’d first been a professional footballer. Vlaar has played 19 games so far this season and at 33 years of age he knows his body better than at any other time in his career. 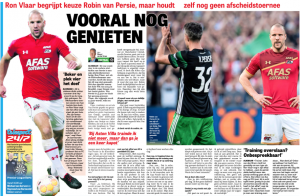 Speaking to De Telegraaf, the defender explained he probably took an approach at Aston Villa which didn’t benefit him in the end. When a footballer is unable to train through the week but plays at the weekend, then things are going to crack eventually. Vlaar told the Dutch newspaper: “That happened to me unconsciously when I played at Aston Villa. In the months before the FA Cup Final I often had pain, I just didn’t train anymore and then I saved it every time just to be there again on Saturday in the match. But you break eventually. That was also evident in the summer. Other players have said that playing with painkillers should also be a no-no, so the balance with training and playing is likely individual and a matter of opinion.